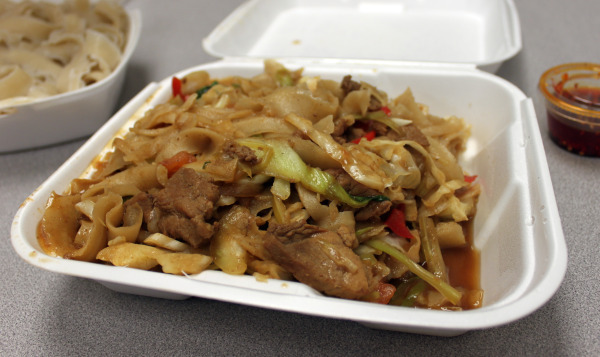 A few days ago I trekked up to the north end of Austin to try Chen’s Noodle House. 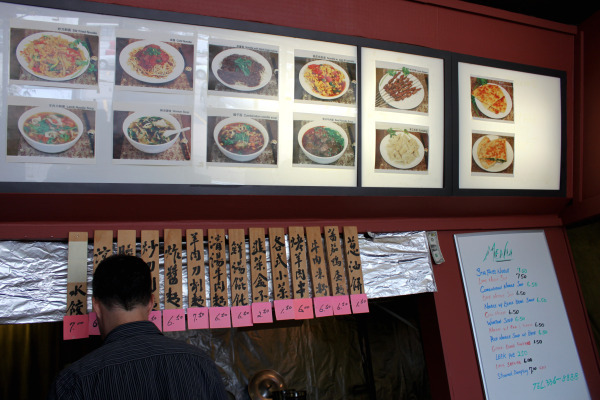 Chen’s specializes in knife-cut noodles, a dish from the Shanxi province of China. I am soooo glad I made the trip… these homemade noodles are worth it! 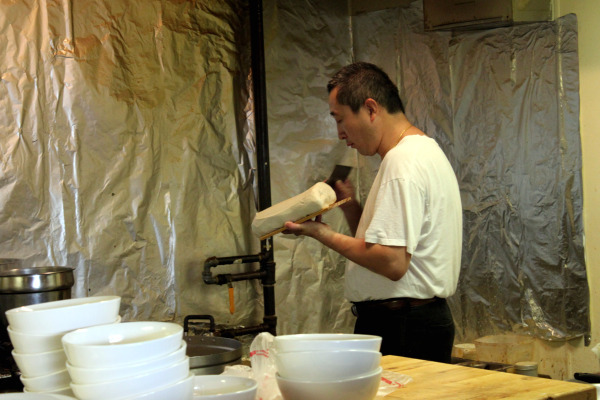 Mr. Chen hand-cuts the noodles as they are ordered. He does this so quickly and deftly. See that rectangular-shaped knife? He just whips it across that ball of dough, and shavings of noodle peel right into the pot of boiling water. The menu is pretty small and manageable. Actually, so is the restaurant. There are maybe 10 tables in there, so you may have to wait for a seat. I got my order to go and ate it at the office, since I was running short on time. 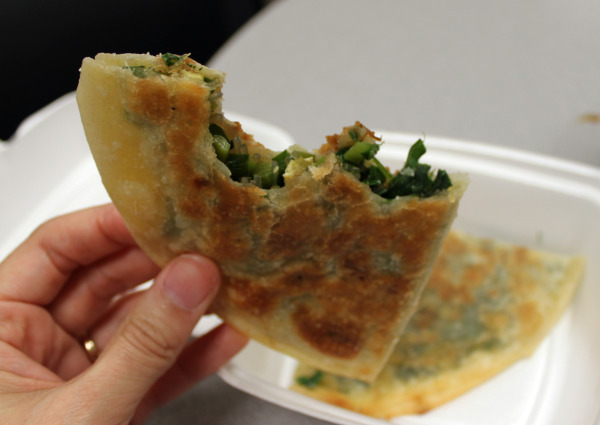 I tried the leek pie, which was a lovely buttery pastry stuffed with Chinese leeks. It was made a thousand times better by dipping in the chile oil that was packaged on the side. These are the stir-fried noodles, tossed with pork, carrots, bell peppers, and bok choy. This is the beef soup… at the restaurant, it’s served in huge bowls, but for take-out, the broth and noodles are packaged separately. There was no way I’d find a bowl big enough for both… so I just ladled a bit of the broth and a bit of the noodles into a small bowl. 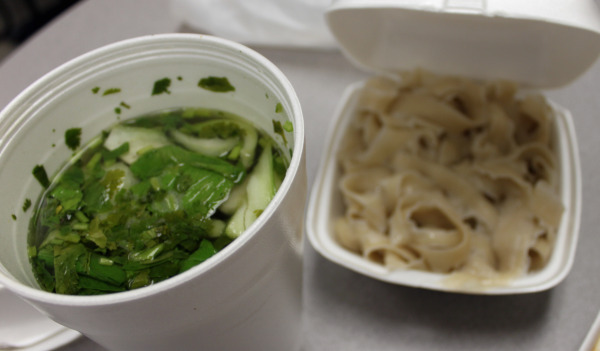 The broth is well-seasoned and aromatic with cilantro; the slices of beef were thin and tender, and the noodles… oh! The noodles! They’re chewy and thick and wonderful. I love knife-cut noodles the best out of all Chinese noodles. I prefer thicker, more uneven noodles to the thin, stretched out ones (and sometimes I’ll use dumpling peels, roll them up between my palms and just eat them as noodles with meat sauce :D) because of the variety and doughy chew. I went to that place back during Medicus days since it is sort of near there. I went there specifically for the lamb noodle soup, as I had heard that is their specialty. It’s pretty yummy and worth the trip to north Austin! That’s next on my list! I think the broth for the lamb soup is supposed to be pretty lamby…? The broth in the beef soup was really clear and tasty.